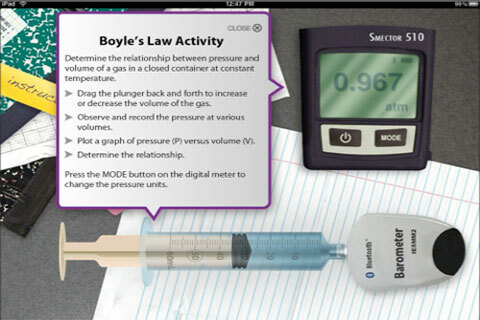 This app is great if you don’t have a set of syringes to use as a means of measuring volume and pressure. Units available with the app for pressure include atm, kPa, or mmHg and a simulated digital measuring device is included. A quick slide of your finger back and forth on the syringe changes the volume of the gas in the syringe and as a result the pressure exerted by the gas is displayed. Pair this up with a nice graphing app and a nice graph showing the relationship between pressure and volume and volume and temperature can be displayed quickly. A similar simulation is also used for showing Charles Law. See the Pick Link for the download location. This link should take you to the MacApp Store where you can download the application, if it is available in the store for your country. I do not own the app therefore I have no say it being downloaded.